Brachycephaly is one of the most common forms of flat head syndrome and is characterised by a flattening at the back of the head and disproportional cranial width. For more information on what is brachycephaly and its causes, please read our earlier blog post. One of the first signs of brachycephaly is a flatness to the back of your baby’s head. 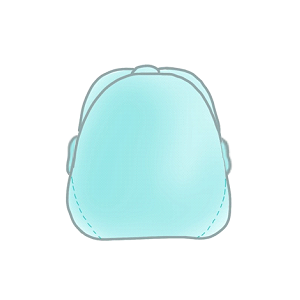 This flatness can usually be seen from above and from the side. The dotted line on the diagram shows a normal-shaped head compared to a flat brachycephalic shape. This is often caused by your baby laying on their back and applying pressure to the soft spot of their skull. If you have noticed flatness, we would recommend that you continue o place your baby on the back to sleep but to increase tummy time during waking periods as soon as possible. If your baby’s head is wider than normal or the widest part is just above the ears, they could have brachycephaly. The diagram below resembles the way brachycephalic heads are wider at the back with the dotted line showing what a comparatively normal head shape would be. You might also notice that your baby’s ears are pushed out when looking at them from the front. The diagram below shows the way your baby’s forehead might be affected by brachycephaly. Both or one side might bulge out or your baby’s brow could be wider than expected due to the widening of the head shape. 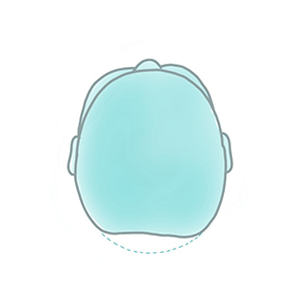 A bulbous forehead is not exclusive to brachycephaly and can also be a sign of deformational plagiocephaly, so it is always best to be assessed by a clinician for a second opinion. 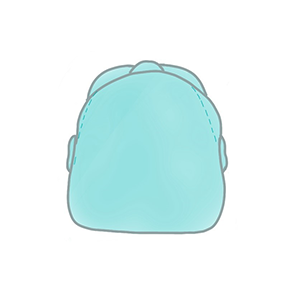 Because of the way brachycephaly flattens the back of the skull, your baby’s head might be higher at the back instead of smooth and round like the dotted line shown below. This ‘pointed’ shape can also be typical of babies who experienced external force from forceps or vacuum extraction at birth. If any of these descriptions or images resemble your baby’s head shape, they could have brachycephaly. 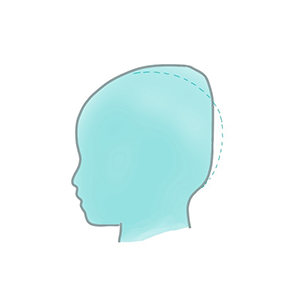 The earlier flat head syndrome is detected, the higher the chances of correction. We would recommend booking a free consultation with one of our clinicians so your baby’s head can be measured and assessed by an experienced professional and they can advise on the best treatment based on your baby’s needs. If it turns out that your baby does have brachycephaly, we suggest starting with repositioning techniques before exploring further treatment options. However, depending on the severity of the brachycephaly and your baby’s age, you may want to consider a corrective brachycephaly helmet. The TiMband is our custom-made orthotic helmet which can significantly improve cases of flat head syndrome and is worn for differing lengths of time depending on the severity of the deformity. For more information or to book a free, no-obligation consultation with a clinician, contact us on 0330 100 1800.